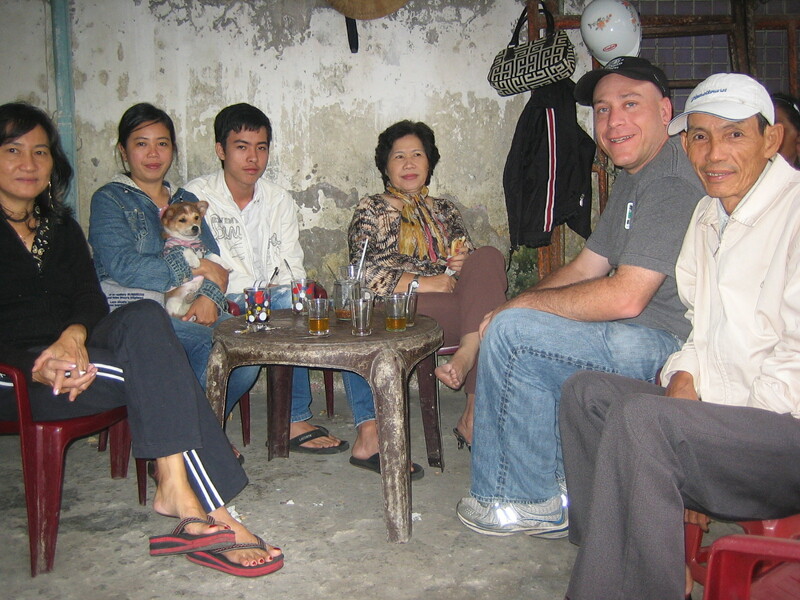 My friend Jeff Ordower came out to meet me in Hà Nội for ten days of travel in Vietnam, where Ken and I lived between 1999 and 2001. 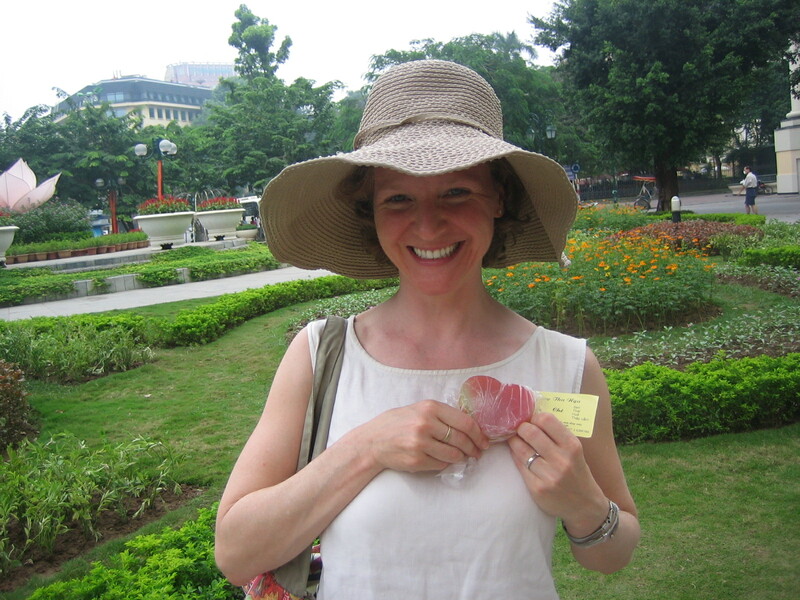 Here are the Seven Things I Learned During My Trip To Vietnam (seven being a most auspicious number). Warning: if you object to exotic meats, judgmental opinions, or state-sanctioned sin, consider not reading further. I was grateful to be met immediately upon my arrival by Christina Schwenkel and Rudi Scheutz. Christina had been my partner in many, many adventures during our first residence. With Rudi still working in Cao Bằng province, Christina divides her time between Vietnam and California, and walked me through to the changes that had taken place in that city since I had last been there. In celebration of the 1,000th anniversary of its founding, marked this past October, Hà Nội had been given a face-lift, and its beautified parks, decorated boulevards, power-washed buildings, and new strings of lights made it a spectacular time to visit. Christina showed me the new office buildings that had sprouted up seemingly at random across the city, enormous statuary erected to celebrate Hà Nội’s great leaders, and parks that had been so scrubby and concrete-covered as to not even register as parks that were now green and carefully tended. My mental map returned to me not on the lines of the Old Quarter’s labyrinth or the grid of the French District, but rather along the block-by-block negotiation of what was still there and recognizable. There was the ice-cream restaurant on the lake, and there was the hulking Socialist-style Post Office. The bánh giởi were still for sale underneath the banyan tree on Lý Quốc Sư Street, and you still needed to head west from the coagulated pigs’ blood and fruit stalls to find the entrance to the Day Market. My experience forgetting pretty much every word of Thai I’d ever spoken convinced me that my Vietnamese would be gone, too. But I had learned to read and write Vietnamese (as I did not with Thai), which is apparently what my brain requires to retain anything over the course of a decade. So the file cabinets in my brain labeled “Vietnamese” slowly opened, with the sought-for word of phrase emerging at random. As I fumbled through a sentence, the preposition or idiomatic phrase or even the random name of a color would occasionally emerge as I spoke, or I would stand there substituting other words or charades until my auditor was able to guess what it was I was trying to say and supply me with the word. The value of what I could recall was also dubious. I could easily pull up rarely-used terms like “doctorate” and “sanitation,” but I struggled for “hungry” and “driver.” Comfortingly, though, it was slowly coming back to me, and quickly enough for our needs. Familiar faces emerged, as well, and it seemed I had not been forgotten, even by those not expecting my return. 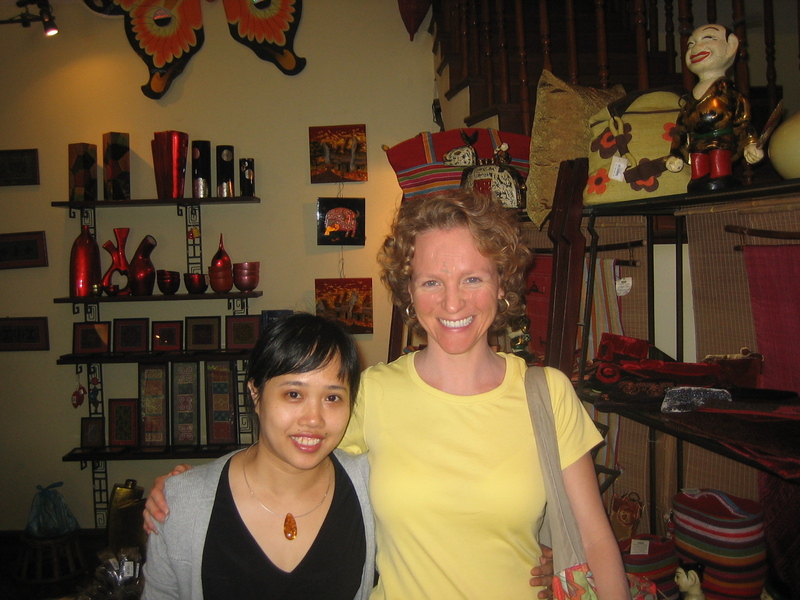 That first night, Christina and I passed by Cở’s, a dress shop we’d used for some high-end tailoring. It was closed, but there, eating her dinner with her employees behind the plate glass, was Miss Cở herself, now heavily pregnant, to whom we raised our hand in greeting, and she slowly raised her hand back at us, as if we’d returned to her shop in some confusing dream. One afternoon, I returned with Jeff to the NGO handicraft shop where I’d done some consulting work, not expecting to see anyone there I knew at all. No sooner had the shop door-bell rung behind us when Miss Mơ looked up and immediately crowed, “Older Sister Zooliet!” Jeff was dumb-struck, as was I, but she assured me she had “always kept the picture of Older Sister Juliet in her mind,” although I looked different, and thinner now. Cheers, Little Sister Mơ. My return to The Chè Lady did not go so smoothly. The Chè Lady, as she is known to us, runs a chè shop on a corner near the French Opera; chè is the Vietnamese version of a common South-East Asian dessert drink, crushed ice mixed with various syrups, jellies, candies, and sweet beans. You both drink it and eat it with a spoon. Hers is chè thập cẩm, which translates to “chè with all the fixings.” Ken and I had been regular patrons, and he’d seen her a few times over the years. I had been The Chè Lady’s main ammunition in her battle to get Christina and Rudi to produce some children—“Little Sister Juliet now has children to take care of her when she gets old, and so should you”—and Christina had told her I would be returning. When I did return, however, she drew a complete blank. Sweating profusely with awkwardness, I told her who I was and reminded her of the people with whom I would come to her shop, but she kept nodding politely and repeating, “Would you like to eat some chè? Please sit down.” Considering that her age could be anywhere from 60 to 80, given the power of Chinese hair dye, and that it had been ten years and two babies since she’d seen me last, I finally let it go, and made myself be content to sit on that corner again and eat chè with Jeff. But her daughter kept railing at her, with the upshot being “come ON, what do you mean you don’t remember her, she used to come in all the time with Little Sister Christina.” About ten minutes into our chè, the light went on, and The Chè Lady remembered me at last. She was moved to great tenderness by my return and by my remembering her. We spoke of our families, Ken, the children, everything that has happened in the past decade. As a parting gift, she gave me a nine-layer cake, a bland, rainbow-colored, heart-shaped jelly-cake made out of sticky-rice flour and food dye. “It is shaped like my heart,” she explained, “Because I love you.” No one could have imagined The Chè Lady, whom I remembered as an outsized, bossy personality, as capable of such sentiment. As if we knew it was unlikely we would meet again, we exchanged addresses and emails—I am now in possession of The Chè Lady’s real first name, and it will cost you a kilo of Café Mai coffee—and I departed with my nine-layer cake pressed close to my own heart. But this being Vietnam, she still charged us for the chè. Other people had prospered more conspicuously than the Chè Lady since I’d left Vietnam. Without a doubt, the biggest change in Vietnam was the presence of more cars and more automobiles. In 2001, the flood of cheap Chinese motorbikes was only just beginning to put a dent into the fleets of sturdy black bicycles, and cars were few and far between, mostly for elite Party members, wealthy NGO staffers, and the embassies. Now cars are everywhere, despite a 200% luxury tax, and there are only a few bicycles remaining on Hà Nội’s streets. The traffic was awful, even in a city that had always been congested, and the air quality suffers proportionately as well. I can’t get overly moralistic about people wanting cars—if I’d lived there, I’d want to drive around with my children safely armored, too—but there were no more children riding three to a bicycle or families of five perched on a single Honda Dream. The children, particularly boys, are more indulged now. Stalls selling snacks and cheap little games had sprung up near schools, suggesting that children now had spending money, a completely new concept. There were more overweight little boys than I’d seen before, but not yet girls, suggesting that the capacity of parental indulgence was still running in its usual channels. Wealthy families treated themselves, too. New kinds of restaurants for the new middle and upper-middle class had appeared, often purveying familiar dishes in chic settings. 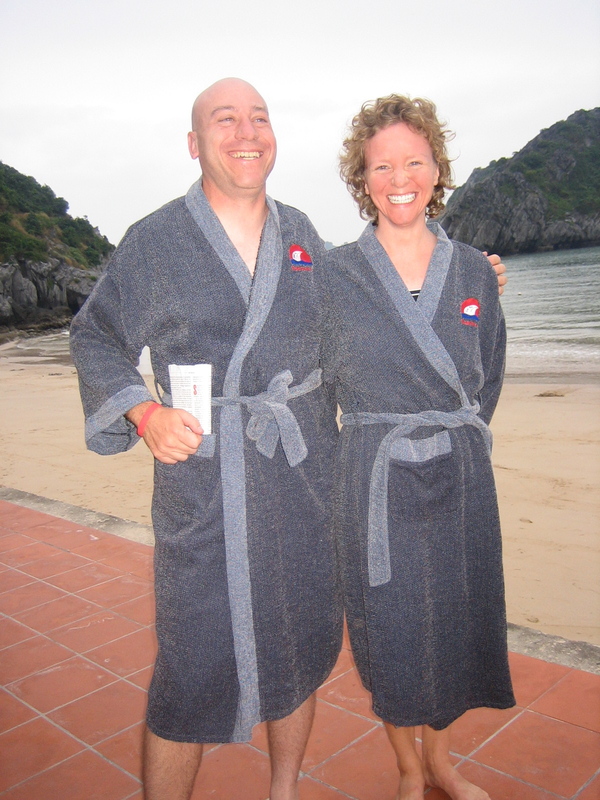 Where once hotels were patronized solely by foreigners and the upper echelons of Party membership, resorts catering primarily to Vietnamese tourists had now emerged, like the one Jeff and I stayed at on our Hạ Long Bay tour, resorts so posh they supply matching bathrobes. Meat has always been a powerful indicator of wealth in Vietnam, and one of the greatest changes I noticed in the north was the incredible proliferation of restaurants specializing in exotic meat: dog, cat, tortoise, and snake being the most popular (monkey is still illegal, and, while surely available, isn’t advertised). Jeff and I made a game during a dreary ride out to Hải Phòng to spot as many signs as we could that advertised serving both cat and dog, as if they could get along on the plate. 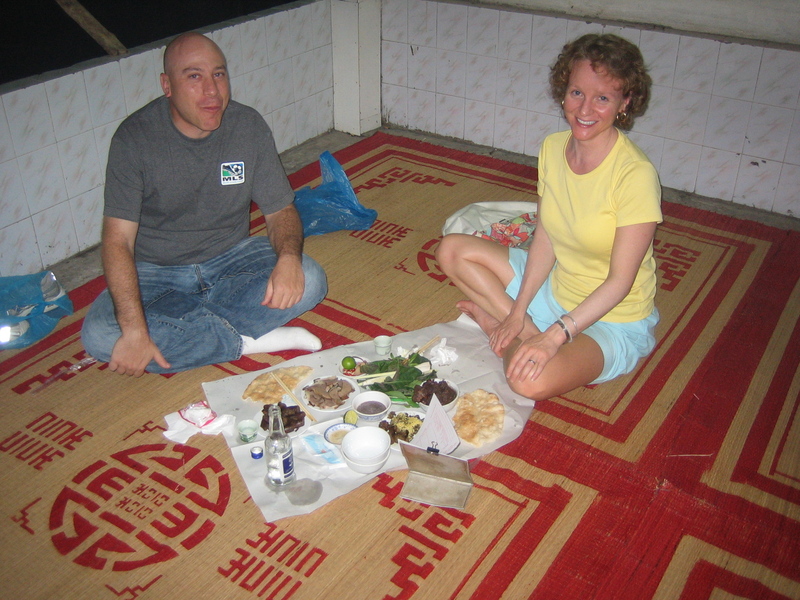 This was, of course, after Jeff and I had gone out to the dike road along the Red River in Hà Nội to get our share of exotic meat and eat some dog. We walked across the wooden gangway to the second floor of the stilt house, the same restaurant I’d been to years before, and climbed up to the third floor. We were greeted by teenagers handing us plastic bags for our shoes and signs warning us that the restaurant was not responsible for lost or stolen property. Jeff took in the mildewed concrete, the dingy plastic mats, and the couples seated on the floor with their meals on a hastily-torn sheet of white butcher’s paper in front of them, and expressed mild surprise. He had been expecting some ceremony befitting a luxury food, something more formal and elegant. “No,” I explained, “This is a restaurant of ill repute.” Dog, like all exotic meats, is “good for men,” and the proximity of dog restaurants to karaoke bars and brothels is not coincidental. While we drank our good Hà Nội-brand vodka, examined the unusual herbs served with the dishes, and surreptitiously tried to determine the relationships of the two very drunk men and their demure companion across the room, the other couples all were served, ate their meal, paid their bills, and hurried home to enjoy the effects. Our meal of “dog seven ways” turned out (to our relief) to be dog only four ways: boiled and sliced, stewed with anise seed and cinnamon, stir-fried with ginger, and in sausage. For those uninitiated, dog is full of protein and iron, and is a very dark, rich, gamy meat. Pregnant women are advised to eat it—particularly dog’s paw soup—for its restorative properties. The Vietnamese like a lot of gristle to their meat—all the better for the tongue and teeth to probe, extracting all the flavor—and my first bite, most of which was a nub of cartilage, had me retching. After more vodka, I did much better with the cold, boiled dog, indistinguishable from venison. As I remembered from the last time, I liked the traditional whiskeys served with dog much more than the dog itself. Now, before my dear readers get up in arms over my eating Lassie yet again, the dogs served at dog restaurants have never been anyone’s pet. Like cattle, they are raised in uniform herds for the sole purpose of being eaten in restaurant. They are bred for color, with sandy-haired dogs the most valuable, as they resemble gold, brown being the mid-range choice, and black being your low-budget option. They are identical squat little mutts with long tails, often seen in trucks or bamboo cages on the back of motorbikes headed to market. Yes, you can hear them howling in pens not far from the dog restaurants, but what confident carnivore objected to being reminded that the meat she is eating was once a living thing? If you eat meat, there’s no reason not to eat dog, except that we sentimentalize dogs and have created a taboo against eating them. I will be interested to see the fate of dog restaurants, as the Vietnamese continue to acquire the rich-world indulgence of having pets, and begin to sentimentalize animals themselves. Social evils—prostitution, gambling, drug abuse, and superstition—are no longer quite the Party obsession they once were. The fabulously kitschy propaganda posters against them are now relegated to the shops catering to amused foreigners, and the police are no longer enforcing the laws against some of them. For the first time, I saw paid companionship, kind of a soft prostitution in which Western male tourists buy themselves a temporary girlfriend and travel guide for their visit to Vietnam. Jeff and I amused ourselves by trying to distinguish the occasional bona fide Vietnamese wife or girlfriend from her more explicitly-mercantile sister: the difference can always been spotted in the footwear. We saw more obviously gay men and boys on the streets and running businesses, although a lesbian counterpart was not visible, as it is here in Thailand. The most explicit evidence that the Social Evil Police had been transferred elsewhere was found in the Party-owned Huong Giang Hotel in Huế. Once the only decent hotel in town, the Huong Giang is an oppressively ornate behemoth, decorated entirely in curled and shellacked wicker, from lamp-shades to laundry-baskets. 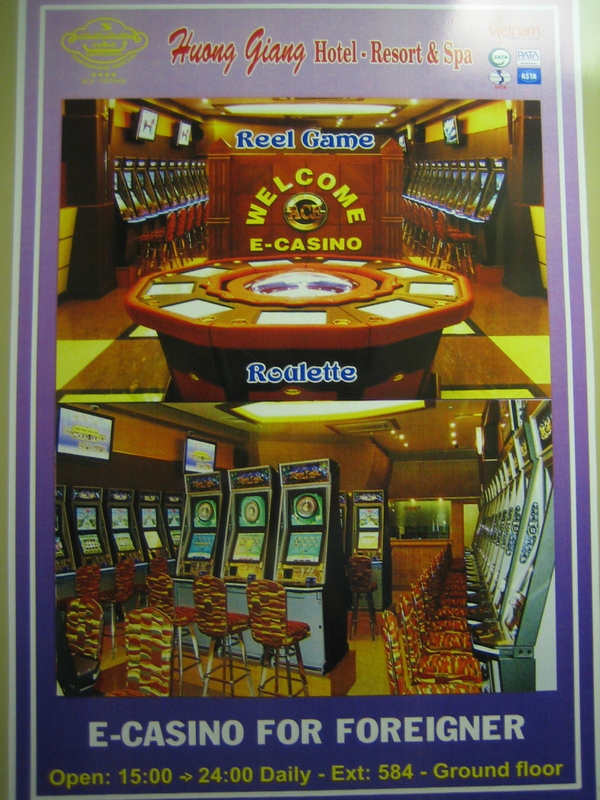 One addition that had been made in the decade since I’d stayed there was the “E-Casino For Foreigners” on the first floor, where foreigners could gamble for Party profit, with their gambling technically taking place elsewhere and not on Vietnamese soil. 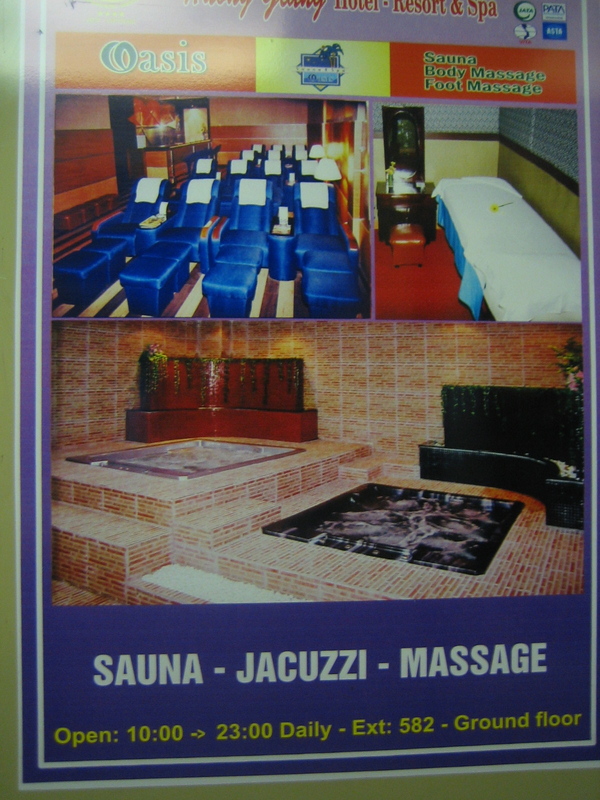 Another addition to the hotel was the new Jacuzzi, steam-room, and massage facility. I thought a hot-tub sounded like a fantastic idea after a day of tramping around the Citadel, and went downstairs in my bathing suit and embroidered hotel bathrobe to use it. I was first surprised that it wasn’t simply poolside, as I’d expected, but rather was part of the larger “health” facility. The presentation of the “menu” to me as I entered the facility also surprised me—who ever heard of a guest paying to use a hotel’s Jacuzzi?—but I thought, what’s a few dollars to my aching lower back? So I repeatedly declined the offers of massage services urged upon me and was ushered through the massage room, where five bored women were lounging around watching TV. One jumped up, but upon hearing that I did not want a massage, muttered something unpleasant, gripped my upper arm with iron-clawed fury, and marched me off to the steam-room area in the same way I would march Ascher off to his room if he were having a temper-tantrum. I had thought one had some choice in the services offered (hence the menu) but her disappointment and anger were palpable. She handed me off to a young man who seemed rather taken aback by my presence. He indicated the frosted-glass stall where I was to shower before using the hot-tub, and handed me some towels. The hot-tub, as I sank into it, was disappointingly tepid, and I called out, “Hey, Little Brother! The water isn’t hot yet!” “Oh, yes,” he said, “Just a moment, and it will be hot.” I sighed, knowing how long it would be until it actually heated up, and resigned myself to contemplating the wicker decorations that had been conceived for this part of the hotel. How odd it seemed that the hot-tub was not ready to use. Then a Korean man walked in from the steam-room, clad only in a towel. He looked at me strangely, and then went into the shower stall to rinse off. Only then did I realize that the glass was frosted only as decoration, not as any kind of concealment, and I was being treated to a full frontal view of this man as he showered. The light in my head went on, and I realized that this facility catered exclusively to men, a fact brought further home when I went later to look for the women’s toilet and found none. The masseuse had been angry because she had been the next in line for a customer, and I had declined her charms. At this point, I decided that I might as well enjoy myself, since there was no point retreating now, and took a very pleasant steam-bath, stretched out my legs and back, and returned to the now-hot Jacuzzi. May the Party enjoy the profits gained off of my Western shamelessness. As a side-note, along with Social Evils not being quite so evil anymore, it is also safer to be Catholic again. When we lived in Hà Nội, the secret police would stand, not so secretly, outside of the Cathedral and photograph attendees. Now the Cathedral has been refurbished beautifully, the statue of the Madonna in front proudly wears garlands of flowers, and smaller churches and cathedrals have sprung up in brightly-panted concrete across the Red River Delta and around Huế. As the Chè Lady did, many men and women are now wearing little gold and silver crucifixes openly in public. In 1999, the act of walking down the street as a foreigner was to invite aggression. Xích lô (rickshaw) drivers would pedal slowly alongside you, shouting, “one hour, madam, one hour,” regardless of whether you were actually “madam” or “monsieur.” Black-market ladies would descend upon you, waving handfuls of the counterfeit Vietnamese đồng they hoped to fob off on you. Souvenir vendors hounded you, walking along side you for blocks and blocks, until you finally yielded and bought some piece of trash you didn’t want anyway. In Hội An, a World Heritage town south of Huế, I was once forcibly assaulted and dragged into a tailoring shop, as if somehow this violence would convince me to have clothes made there. And then there was the army of shoeshine “boys” carrying their wooden boxes of shoeshine supplies, many of them in their early twenties and some of them heroin addicts. They roamed the city, targeting bia hơi (fresh beer) stalls and Hoàn Kiếm Lake, begging foreigners to stop and let them shine their shoes, and seeing if you were foolish enough to let them pick your pocket while they were at it. The black-market ladies still linger, confusedly enough, around the ATM machines, as if they haven’t figured out that those machines spit out real đồng on the spot without the necessity of a black-market transaction. The souvenir vendors have learned that force doesn’t pay, as they are considerably more hands-off than they were. The police actually intervened in Hội An’s marketing tactics. The shoeshine boys have been forcibly relocated back to their native villages. 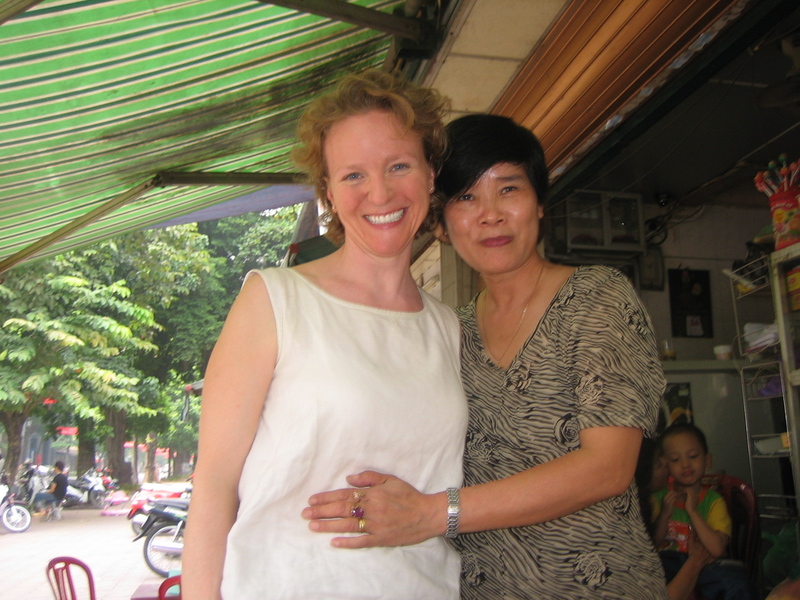 Christina met one of them in Cao Bằng, who greeted her by name and was delighted to ask after all his old Western acquaintances. When we lived there, any tourism I undertook I did independently, using the cocoon of private drivers and hired boats to spare myself the miserable vulnerability the group tourist suffered. 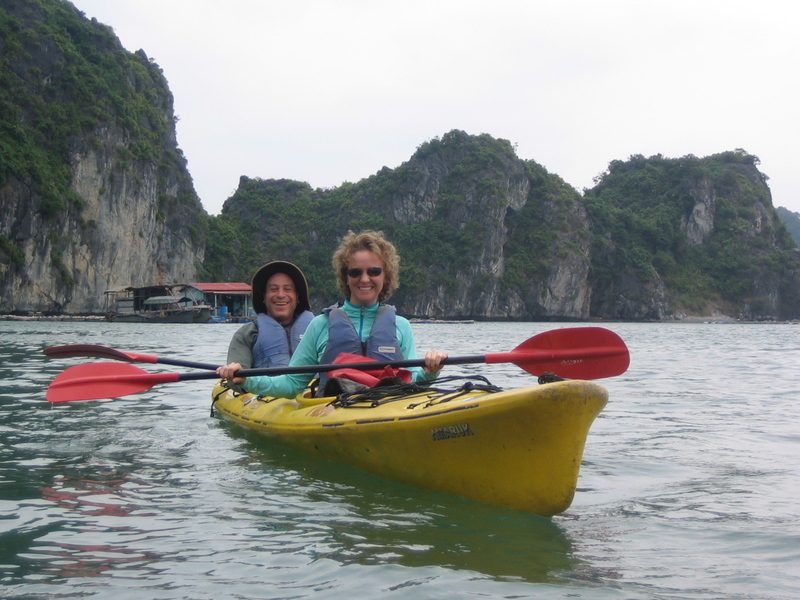 It was with great trepidation, then, that I went with Jeff to sign up on a group tour of Hạ Long Bay. We would spend two days and one night cruising the bay on a “junk”—a fishing boat that had been made over into a dining room, twelve tiny cabins (complete with shower, toilet, and air-conditioning), and a upper-level lounging deck—and then another night in a resort on Cát Bà island. My fears of being a prisoner to mercantile schemes and uncomfortable arrangements that would bear no resemblance to what we had reserved all came to naught. The junk was unbelievably comfortable, the food acceptable, the service polite—a small miracle in itself—and everything actually began, happened, and ended as promised. 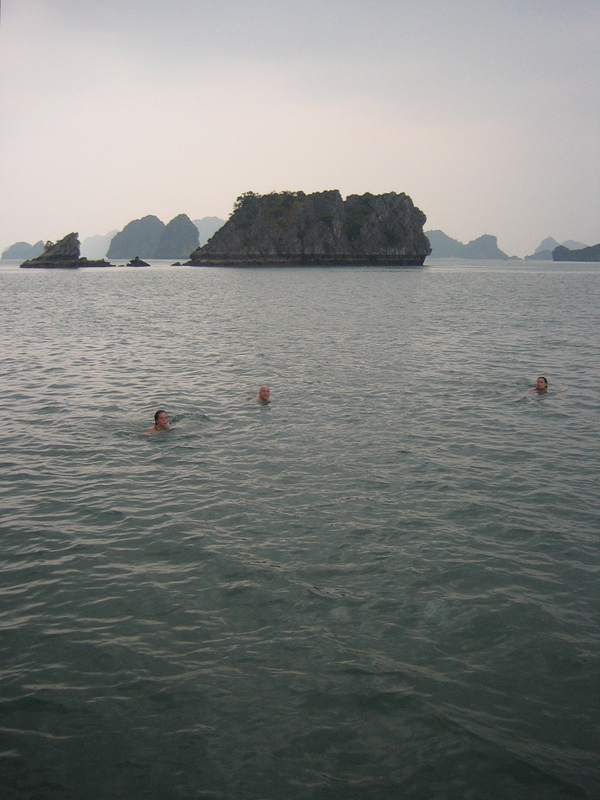 Because Hạ Long Bay has long been a primary tourist attraction, I avoided it like the plague when we lived there. Now I am so glad to have gone: it was just as beautiful as people said, and it didn’t hurt that it was overcast and cool so that we could sit out on the deck chairs and watch the enormous karsts slide silently past us. The boat anchored in the middle of nowhere around 4 PM for the night, and we swam off the boat in the jade green water. I swam out as far as I thought was reasonably safe, orienting myself by the karsts, out until I could float under the gray sky and hear nothing but little waves lapping against the limestone. After dinner that night, Jeff and I sprawled out on the top deck, while the boat revolved slowly in the breeze and the hulking shadows of the karsts glowed under the rising moon. Although the population of Vietnam is skewing younger and younger every year, there are still many elders who fought in the wars—the American War, the war on the Cambodian border, or against the Chinese– or lost their loved ones in them. Anh Giao, the genial night manager of our hotel in Hà Nội was the son of two veterans of the siege of Điện Biên Phủ, which finally broke the French presence in Vietnam, and he himself fought against the Americans. On our flight to Huế, I sat next to a soft-spoken man who had been a chemical engineer before fighting for the South, and had been returned to his native city to work in a cigarette factory. After years of industrial servitude and probably unimaginable shame, he had visited Hà Nội simply to see what it was like. In his free time, he kept up with his English and was learning Mandarin from watching Chinese films. We met veterans everywhere. Right now, Vietnam is engaged in an on-going death watch for General Giáp. Giáp led the siege at Điện Biên Phủ, and was Hồ Chí Minh’s primary military leader during the American War. When Uncle Hồ died in 1969, Giáp stepped in and provided crucial military and political leadership. He will be one hundred years old next August, and already Party leadership is jockeying for positions around his casket. There will no doubt be much Western pontificating about his death providing “closure”, and endless Party eulogies on his accomplishments will be given and broadcast and published. Such “closure” will do nothing to ease the grief that is still palpable. 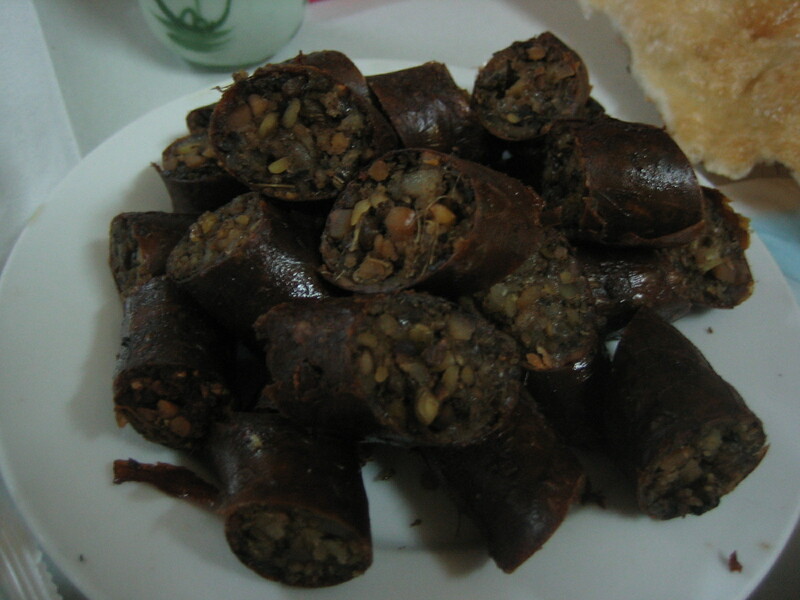 In Huế, we ate bánh cuốn on the sidewalk with two elderly ladies. Upon hearing my modicum of Vietnamese, the elder of the two launched forth on her life story in an incomprehensible flow of Central dialect of which I was hard-pressed to get even the gist. I figured that she was telling me that her children had gone to Saigon and that she missed them, but then (after much pantomiming of machine guns) I realized to my horror that she was telling me they had been killed in Saigon during the American War, all six of them. She illustrated her sorrow by pounding her fist into her head and describing how she had run screaming into the streets: this much I was able to grasp but whether they had fought for the North, or the South, I couldn’t tell you (and in Huế, it could easily be either). She might have been saying she could now earn money at her beer stall, or she might have been saying she did or did not earn a government pension, I had no idea. But she’d lost six children in the American war, that much was clear. A silence fell over the table when I finished my crude translation for Jeff. Out of the best and most precious file-cabinet in my mind, I extracted the standard Vietnamese phrase for condolence, “chia buồn,” which translates to “I share your sorrow.” “Chia buồn!” the elderly lady gasped, turning to her friend, “Little Niece there said ‘chia buồn’!” For a panicked moment, I thought she had been insulted that an American would even try to express sympathy, but she grasped my hands across the table and said it again, as it if might be of some comfort. This is the top edge of one of the enormous, exquisite cast-bronze urns scattered across the presentation courtyard of the Citadel in Huế. Between my thumb and index finger, you can see a bullet hole from the 1968 Tết Offensive, which raged across the city. Like the naked patches of mountain forest stripped bare by Agent Orange, so much of Vietnam is like this: unbelievably beautiful, permanently marred by war. Vietnam is still a country where people remember being hungry, and there is no shame in cheating anyone, only shame in being caught. I will spare you all the anecdotes about the new strategies for increasing your bill at market food stalls, the nasty little victories I did or did not win over the taxi-cab driver with the meters running three times too fast and the one who tried to hold our luggage hostage, the women who were so friendly and warm in Huế, and then demanded ten times the going rate for our noodle soup, and the sampan rower whose astonishment at having a Westerner ask to be taken across the Perfume River was only overcome by that same Westerner knowing what it should actually cost. Sometimes bargaining was playful and fun, as it is in Thailand, but most of the time it was the Vietnamese blood-sport I remembered it to be. The exhaustion of being insulted and taken advantage for two years in Hà Nội had not dissipated much over the course of the intervening decade, and the hardness in me re-emerged just as the language had. Jeff, with whom I’d only ever spent time in our various homes, or those of friends, or in comfortable restaurants and bars in familiar American cities, was amazed to see the relentlessness in me. 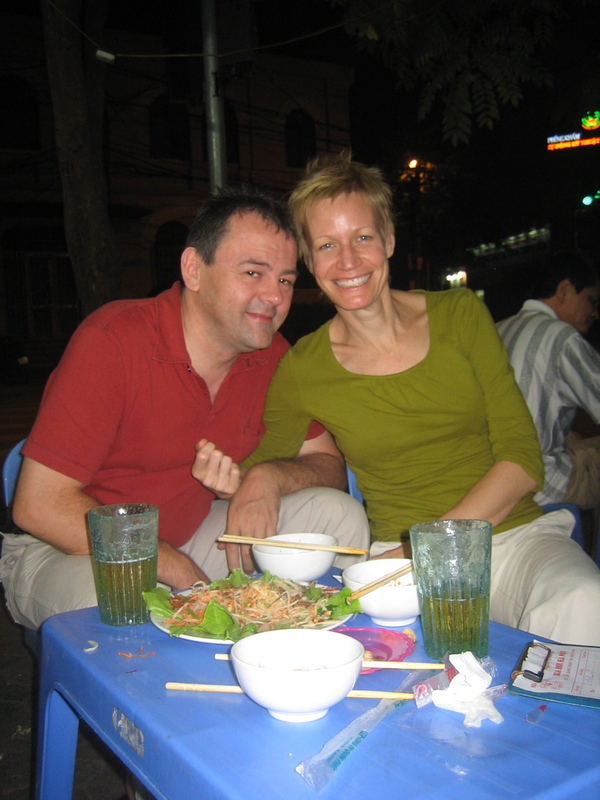 And he had never even seen what I had considered to be the nadir of my Vietnam-induced meanness, in 2001, when, infuriated by the restaurant touts who were pulling me and Christina off of our moving motorbike and into the street, I kicked them as hard as I could. Sometimes, though, Jeff and I struck bargains of mutual and happy benefit. We arrived under-slept and starving off of our 6:00 AM flight from Hà Nội to Huế, declined the hotel buffet (Ascher would have wept for pancake opportunities lost), and asked the bell-boys where to eat. They directed us down the block, where we immediately found a storefront vending bánh mì pâté. Bánh mì pâté is a French baguette split and stuffed with paté, other pork products you’re advised not to investigate too closely, cucumbers, onions, cilantro, mayonnaise, and chili-sauce (Worcesterites, these are available in a fine form at the Mekong market on South Main on weekend mornings.) They also sold the darkest, sweetest, richest coffee you can imagine, in small narrow glasses. The clientele seemed mostly to be part of the same family, and were ruled benignly over by one middle-aged woman wearing a sensible water-proof cover, something like a shower cap, over her traditional conical hat. They were polite and interested in us, asking the usual questions about where we were from, our relationship to each other, whether we’d “established our families yet,” and how old we were. They helped me translate my Hà Nội Vietnamese into their incomprehensible Huế dialect and did not hesitate before charging us the real price for our breakfast. When we wanted to hire motorcycle drivers to take us around Huế’s fabled imperial tombs, we investigated the hotel’s ridiculous official price, and went back out to their café. 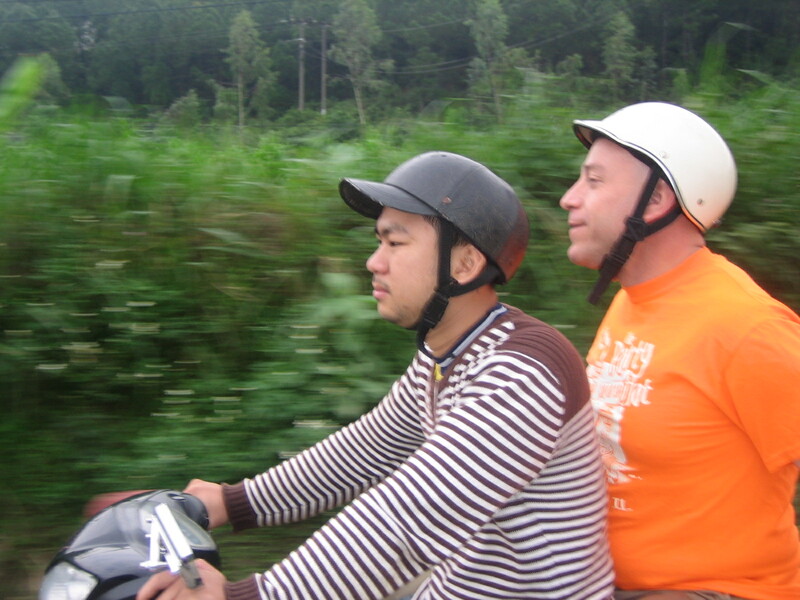 I sat down in front of the ruling auntie, and began to talk about how I wanted to hire two motorcycle taxis (xe ôm) to visit the tombs, good drivers who didn’t drink whiskey, and who wouldn’t drive too fast, this being Jeff’s first time on a motorcycle. I hadn’t gotten half the sentence out before she’d snapped open her cell phone and assured me they were on their way. About five minutes later, a thin, nervous man in his late sixties, Anh Tuyết, arrived, and began to negotiate with me with utmost politeness and respect. We gently bargained until we were both at a place with which we were content: we paid him and his young friend who drove the second motorcycle less than half of the hotel’s absurd asking price and would be spared the poor English that their “guide” would feel obliged to inflict upon us, and he would earn more money that day than he probably would all month. When Anh Tuyết dropped us off at the end of our day, in front of a restaurant he was sure we’d like, he waved the bills we gave him at his friend, letting the whole street see them, happy and proud as could be. As the ruling auntie concluded contentedly when we returned the next day to tell them all about it and, of course, to drink more coffee, “You had a good time and saw four tombs, and two people have money now.” Of course, the driver—a friend of hers, not a relative—is probably now obliged to do something at a discounted rate for her, since she brought him the deal, but that is none of our concern. The imperial tombs are cut off from each other by various streams feeding the Perfume River and the river itself, and the only way one used to be able to visit them—if you weren’t up to negotiating multiple ferry crossings by yourself– was by “dragon boat tours,” an excruciating experience of docking sometimes two kilometers from each tomb, having to walk gauntlets of relentless soft-drink and souvenir sellers, eating a miserable lunch on board, and then often being held hostage by souvenir sellers who would not allow you to return to Huế until you bought something. These tours still exist, with thousands of tourists each year suffering through them, but the construction of various bridges means that you may bypass them now. Anh Tuyết knew all the back roads, the old ones and those that had cropped up around the new bridges, and had absolutely no interest in any road frequented by cars. He was happy to take it slow, and so were we. The resulting route, sometimes circuitous but always beautiful, took us along concrete paths only broad enough for bicycles and motorbikes, and wended along blue- and yellow-painted houses, banana trees, chickens pecking along roadside, teenagers doubled-up on bicycles, children playing marbles in the dust and scrambling to get their game out of our way, and the river appearing and disappearing on our left. As Jeff said, he was unlikely to remember the tombs, but would always remember the xe ôm drive. The only challenge we faced with our lovely xe ôm drivers was to convince them that we really wanted to see Dục Đức’s tomb. The standard three tombs for tourists to see are those of Minh Mạng, Tự Đức, and Khải Định, which follow a neat historical trajectory of classical design to a full-on, dissolute Sino-Viet-European decadence. With varying degrees of NGO and corporate sponsorship, these three have been reconstructed and refurbished beautifully for tourists and for the Vietnamese who take advantage of the free admission on national holidays. Dục Đức’s tomb, according to the Rough Guide (the only guidebook one should take to Vietnam), is still tended by his ancestors, and having seen the others now three times, I thought it was worth adding to our itinerary. The Huong Giang Hotel tourist desk attendant took the usual Vietnamese approach of being sure that she knew what the foreigner wants better than the foreigner did, and told me with bureaucratic flatness, “We do not recommend that you visit that tomb. 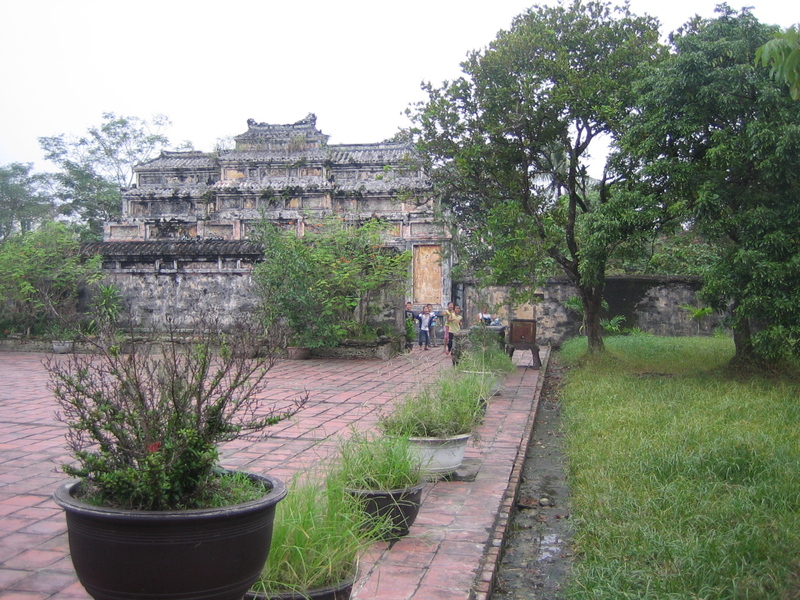 We recommend that you visit the tombs of Minh Mạng …” and so on. Even Anh Tuyết demurred, saying “It’s not pretty. You do not want to see it.” Oh, but I did, even more so when I faced such obstacles in doing so. 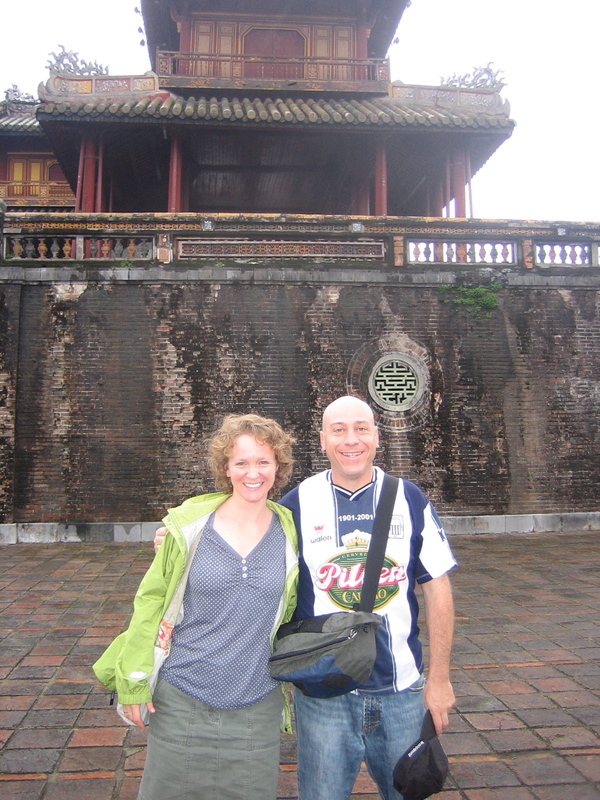 Jeff and I laid a quiet wager as to whether or not we’d actually be taken there in the end, or would be returned to Huế, but Anh Tuyết did us right, and, despite the objections of his younger partner, delivered us to Dục Đức. The tomb complex was small, and we pulled right up to the entryway without any souvenir vendors or ticket takers. 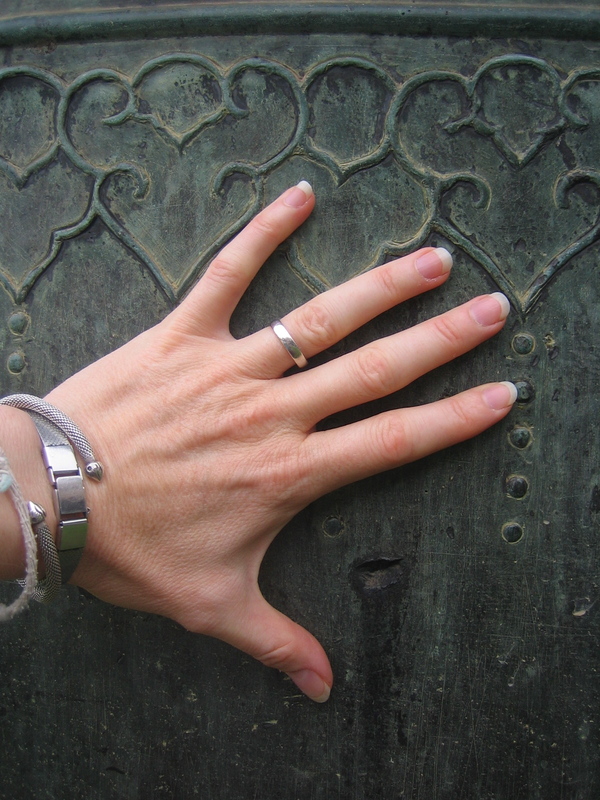 The sole attendant meandered through, pulling open the windows so we could see the shrines. Much to our surprise, the tomb of Dục Đức isn’t really for Dục Đức, who only ruled for three days before being deposed by courtiers for being too closely allied to the French. It really honors his son, Thành Thái, who built the tomb, and his grandson, Duy Tân. Both father and son were correctly suspected of plotting to rebel against the French, deposed, were exiled to Reunion Island. His son, Duy Tân, fought with the Allies during WWII, joined the French Resistance and fought against the Vichy Regime. Before the French finally departed Vietnam, they were repatriating him to Saigon in the hopes that he would prove to be a patriotic alternative to Hồ Chí Minh, when he died in an airplane crash. We were delighted—here was some little-discussed history!–and we did not mind at all that it was “not pretty.” If the Vietnamese think pretty means the gaudy encrusted mosaics of Khải Định’s tomb, or the carefully-polished reconstructions of the Citadel, then, yes, this dark, shabby shrine, with its complicated lineage and charged political content, is not pretty, and better for it. I dug the word for “interesting” out of my file cabinets, and we were all pleased. And then the doors to the courtyard were opened, and we walked out into an overgrown plaza, with ferns growing out of the archway, and startled the children who had clambered over the ancient stone walls and were playing football on the flagstones. The guard made a half-hearted attempt to shoo them away from the property, but they all knew each other by name, and when he saw that we did not mind them at all, he gave up the pretense of bothering with this happy trespass. These children play and scramble and kick up the sacred dust of Vietnam’s last emperors. For at least a little while longer, beauty and history linger as part of everyday life in Huế. Having seen this much, I am content, and need not return to Vietnam again. I send my warmest thanks to Jeff for being such an affable and adverturesome travel partner, to Ken for taking the kids for ten days under trying circumstances so that em đi chơi được , and renewed love and appreciation to Christina, Rudi, Linda, Jenn, Jennifer, Kate, Seth, Joe, and Dai, for having understood the urge to kick someone once in a while. Hi, God: by “kiddy,” do you mean a biblical sort of baby goat or a child? Both sound delicious! Thanks for your comment! When this leg of your journey is history, and you are safely back in Worcester…I shall be looking for your book…Yours can be Eat, Adventure, then take some risks. I’m impressed by those hard bargaining stories, too.